The second district of the city sits at the southern extremity of the central part of Lyon, the Presqu’île formed by the Saône and the Rhône. It is one of Lyon’s most varied and commercial districts. Lyon is made up of three main swaths of land: the right bank, the left bank, and the peninsula, or Presqu’île, that connects them. The Presqu’île starts in the classic 1st district at Hôtel de Ville and the opera, and extend through the 2nd district, a long neighborhood stretching from the historic St. Nizier Church to where the Rhône and Saône rivers meet in the aptly named Confluence quarter. 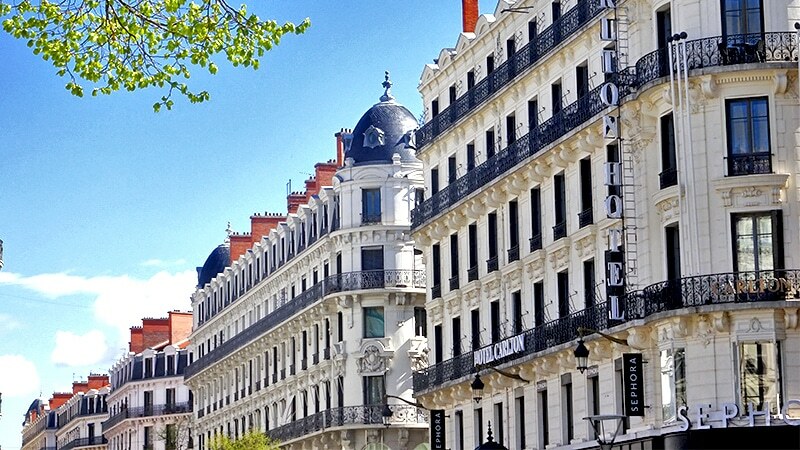 It is the true heart of Lyon, home to the best shopping areas in the city, pedestrian streets, cafés, fountains, architecture, museums, and more. Created in 1852, the 2nd arrondissement makes up a large part of Lyon’s UNESCO world heritage site, designated in 1998. Bordered on the west by the 5th arrondissement and the Saône and on the east by the 3rd, 7th and the Rhône, it combines traditional Lyonnais charm with one of the most modern parts of the city. It is always in high demand by students and young professionals alike. The 2nd arrondissement takes over the reins from the domineering 1st district at the line of Eglise St. Nizier, a historic church that marks the center of Lyon’s Christian heritage and community. 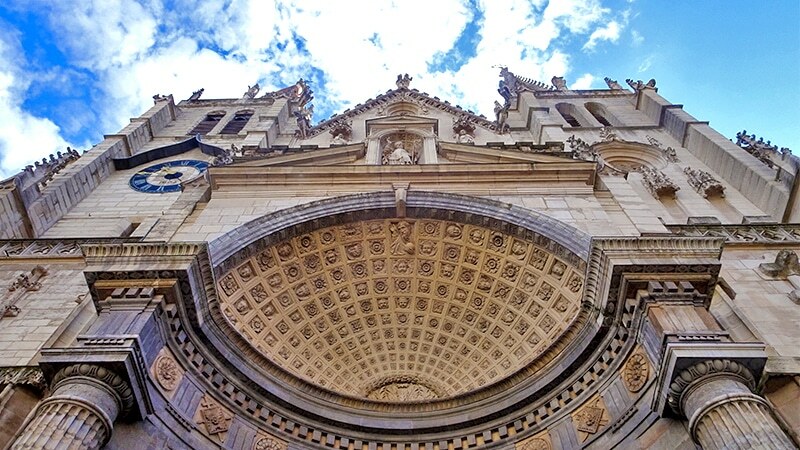 Built on the site of an ancient roman temple in the 5th century, St. Nizier is connected to the memory of the martyrs who died in the Christian persecution of 177. From St. Nizier, the arrondissement heads down the street to the Metro A stop that marks the heart of the Cordeliers quarter, on the famous Rue de la République. Rue de la République is the main street connecting the 1st and 2nd arrondissements, and combined with Rue Victor Hugo and Confluence makes up one of the most famous shopping areas in the city, home to top brands like the Kooples, Zara, H&M, Pull and Bear, Printemps, and Galleries Lafayette. Though it is known as a shopping area, there are still plenty of restaurants, cafés, and bars in the side streets around Rue de la République, making it one of Lyon’s livelier districts during both the day and night. One of the most well-known clubs in the area is L’Ambassade, located at the top of the pedestrian half of Rue de la République, with horrifying opening hours of 12:30-5 a.m., Thursday through Saturday. On level with L’Ambassade but one street over from Rue de la République, Rue du Président Edouard Herriot leads into Place des Jacobins, with its 1856 fountain and 19th century townhouses. Place des Jacobins, in addition to being a popular photo spot, sits at the foot of the equally famous Rue Mercière. Rue Mercière was historically home to the printers of Lyon, which was once a major player in the print revolution. Their stories are now represented in the Museum of Printing and Graphic Communication, housed in the former Hôtel de Ville of Lyon up by Cordeliers. Today, Rue Mercière is filled with classic French restaurants and connects to the bar-filled street of Rue de la Monnaie. Meanwhile, the entire Jacobins area is connected to the Rue de la République by the Passage de l’Argue, one of the oldest “arcâdes,” or arched passageways, in France. It was once a narrow street populated with weaving workshops and later served as a hiding place for Republicans during the 1834 silk-workers revolt. Now it’s filled with the red facades of popular shops. To the west of the Place des Jacobins is riverbank of the Saône, filled each morning with the fresh produce, meat, cheese, and bread of the St. Antoine Market. The quarter is also home to the Place des Célestins and celebrated Théâtre des Célestins. 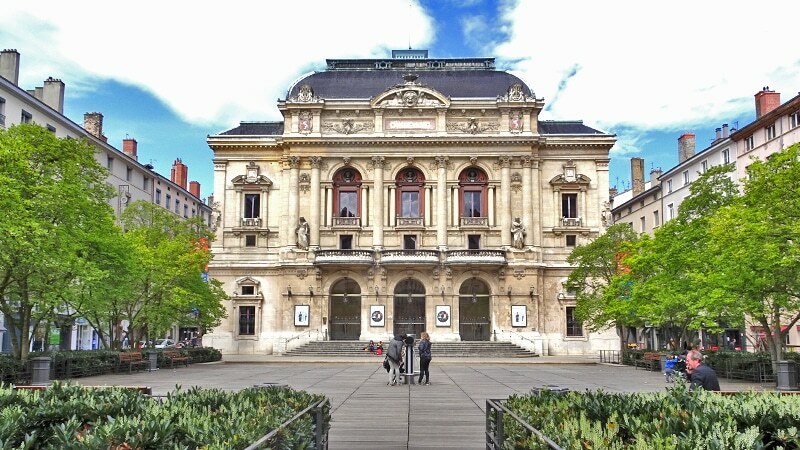 The Théâtre des Célestins was inaugurated in 1877 and stands with the Comédie Française and the Théâtre de l’Odéon in Paris as one of the few French theaters to be used for over 200 continuous years of dramatic art. 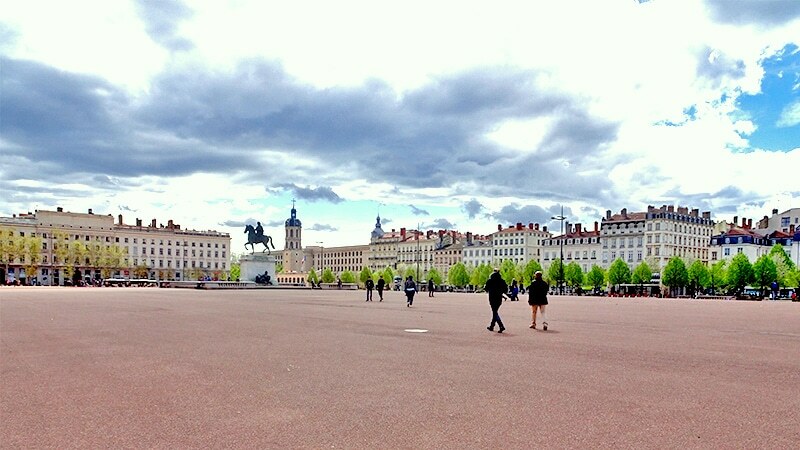 From shopping and feasting in the Cordeliers and Jacobins quarters, Lyon’s 2nd arrondissement opens up on Place Bellecour, the largest pedestrian square in Europe. A statue of Louis XIV sits in the middle of the mostly empty square, which often hosts festivals and fairs, including a Ferris wheel installment during Lyon’s annual Festival of Lights. Bellecour stretches nearly all the way across the width of the Presqu’île, with only a few streets separating it from the quays of the Rhône and Saône. It is also the intersection of the A and D metro lines. The Rhône bank in this area is dominated by the massive Hôtel Dieu. The building was originally built in medieval times but served as a hospital from 1454 to 2010. Many Lyonnais and their children were born there. In 2015 the city announced a project to refurbish the building and turn it into a luxury hotel and shopping area. It reopened in April of 2018, home to a 5-star hotel and brands like Hard Rock Café, Uniqlo, and Dr. Martens. On the south side of Bellecour is the Office of Tourism, the city’s main post office building, and the Rue Victor Hugo, which runs down to the Gare de Perrache at Place Carnot. Sandwiched between name brands at Confluence and Rue de la République, Rue Victor Hugo is a pedestrian street full of small boutiques offering everything from shoes and ties to vintage and haircare. It is the main street running through the Ainay district of the 2nd arrondissement, which stretches between Bellecour and Place Carnot. 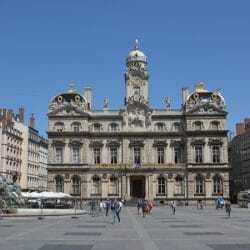 The Mairie, or city hall, for the 2nd arrondissement is located here (2 rue d’Enghien) as well as the Musée des Tissus et des Arts Décoratifs, or the Museum of Fabrics and Decorative Arts. 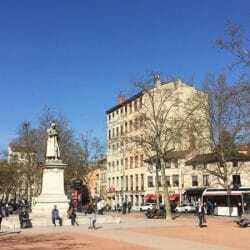 Just south, Place Carnot is a large square that opens on the Gare de Perrache. During the Christmas season, it hosts one of Lyon’s Christmas markets, with food and gift stalls filling the corridors of the square. The Ainay area is served by the Ampère-Victor Hugo on the Metro A line, which runs the length of the Presqu’île down to the Gare de Perrache. The Gare de Perrache, meanwhile, is one of Lyon’s main transportation hubs, connecting to the A line, trams 1 and 2, local and long-distance buses, and trains. It is situated at the beginning of the Presqu’île’s lower half, dividing the 2nd arrondissement in two between its more traditional and more modern sectors. 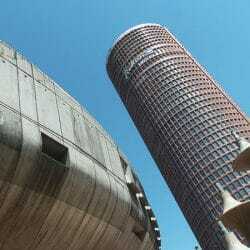 It is also located just next to Brasserie Georges, one of Lyon’s most famous restaurants. The southern edge of Perrache begins the second arrondissement’s biggest subdistrict, Confluence. Confluence, whose name literally means “a junction between two rivers,” is a newer development full of modern and colorful architecture. 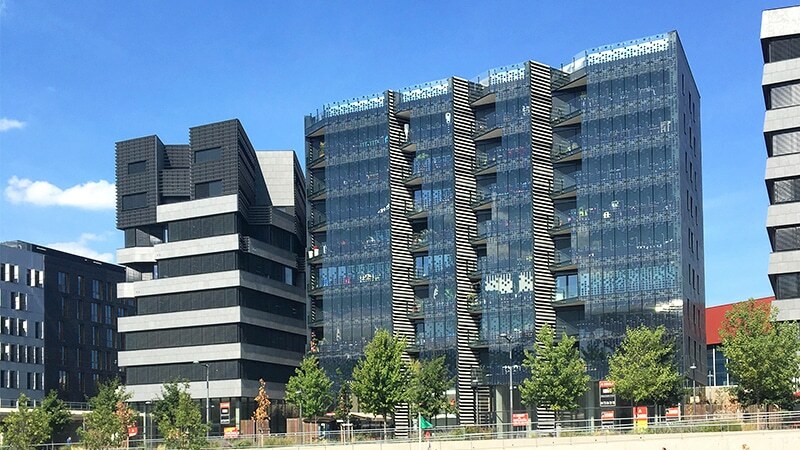 Born from an urban renewal project meant to restore a rundown dock area, the district is constantly expanding with new apartments, office buildings, and the second of Lyon’s two shopping malls. This part of town is served mostly by buses and the T1 line, which takes riders down to the tip of the peninsula. Along the way is the Église Sainte-Blandine, named for Lyon’s patron saint, and the Patinoire Charlemagne, a public ice skating rink that’s also home to the Lyon Hockey Club. The French Immigration Office, or OFII, is also located here (7 Rue Quivogne), and handles matters of visa validation and renewal. Next to the ice rink is the futuristic Confluence shopping center, a three-story, partially outdoor mall with top brands, restaurants, and a large movie theater. On the T1 line it is the stop Hôtel de Région-Montrochet, one before the Musée des Confluences. The museum, meanwhile, is the crown jewel of the subdistrict. 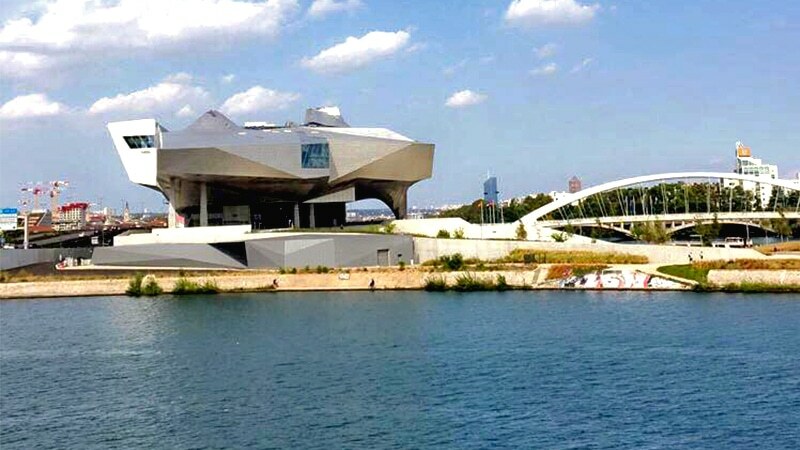 Lyon’s natural history museum, the Musée des Confluences was opened in 2014 after nearly 15 years of development. It is one of the most eclectic and unusual buildings in the city, a combination of metal and glass modeled, as legend has it, after a screwed-up piece of paper. Nearby the museum is the infamous bright green Euronews building and La Sucrière, a cultural center housed in a riverside warehouse. La Sucrière hosts contemporary festivals and conventions, with everything from vintage markets and beer festivals to the yearly Nuits Sonores reserving the modern space. Next door, the popular rooftop club Le Sucre is always hopping with event after parties. Lyon’s 2nd arrondissement is home to one of the most diverse collections of architecture, attractions, and people in the entire city. With everything from traditional bouchons and top brands to alternative nightlife and imaginative buildings, it offers a little something for everyone. Its prime location in the heart of the city, making up a majority of the popular Presqu’île, makes it the perfect place to explore and find out what Lyon is all about, in all its different forms. Tip 1: Be wary of expensive and overpriced restaurants, particularly in the Rue de la République area. Cheaper ones that are just as good can be found in small side streets, particularly around the Ainay-Victor Hugo area. Tip 2: France loves keeping their Sundays free. That means all the shops are closed, so be sure to do your shopping on Saturday or during the week. Tip 3: Just outside the Cordeliers metro stop is the Grande Pharmacie Lyonnaise, the only pharmacy in the city with night hours. If you need medicine in the middle of the night, that’s the place to go.